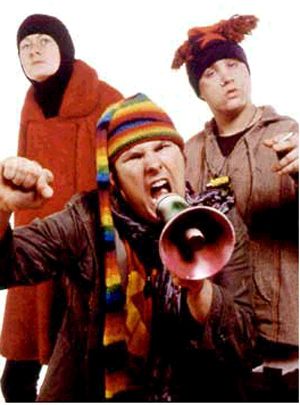 Barry Castagnola, Marc Wootton and Liam Woodman make up Cyderdelic, Devon's top dance act and committed but naive eco-warriors. Last year, they won The Green Light Award for Entertainment at the inaugural BBC2 awards - the prize being a commission for a half-hour show to be broadcast on BBC2. This successful show, Cyderdelic: The Revolution will be Televised, was screened earlier this year. A new six-part series has since been commissioned for BBC2/BBC Choice. Barry Castagnola and Marc Wootton are also the creators of Cydeldelic. They are two of the hottest writer/performers around today. Having performed together in their university days, they have been working together professionally for the last two years. In addition to BBC2's Cyderdelic, they have written and starred in their own half-hour show - Lovely Christmas Makeovers (BBC Choice); recorded a broadcast pilot for BBC London Live - Maurice; written and performed in sketches including: Sin Bin (BBC Choice); Outlaws (a pilot for BBC1) and the Lenny Beige Variety Pack (BBC Choice). They have also appeared regularly on The 11 O'Clock Show (Channel 4). At last year's Edinburgh Festival, they performed to sell-out crowds with their high-energy multimedia show earning them rave reviews. Liam Woodman, Marc Wootton and Barry Castagnola make up the revolutionary Cyderdelic... Devon's top dance act. Individually Barry and Marc have written for and performed in a variety of other shows, including Rumbled (BBC2), The Stand Up Show (BBC1), Comedy Nation (BBC2), The Chris Moyles Show (UK Play), The People Vs Jerry Saddowitz (Channel 5), The 11 O'Clock Show (Channel 4) and Alexi Sayle's You Make Me Feel Like Dancing (BBC2). They won Gold for copywriting at the 1999 ISP Awards for Tango Time, a national radio sales promotion written and performed by Barry and Marc.